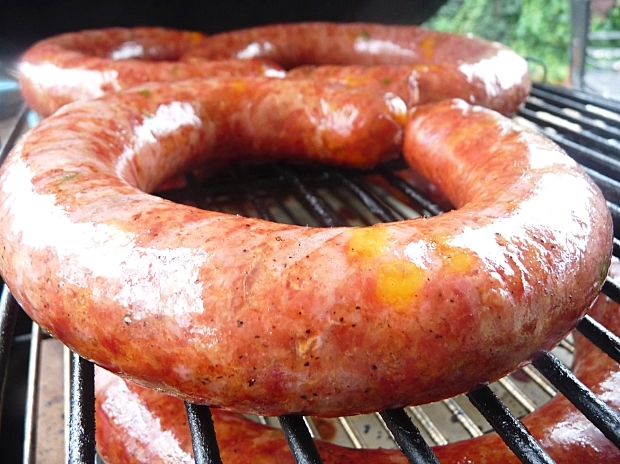 Even though sausage is probably one of my favorite smoked meats, its been awhile since we’ve made any. It’s just such a long process, but the results are well worth it. This past Christmas, I got a 5lb LEM Sausage Stuffer. Prior to that I was just using my grinder as a stuffer. While that works, it’s not really ideal. I had no idea how well my new sausage stuffer would work till we put it into action this past weekend. This thing is awesome!! If you are making sausage and don’t have a dedicated stuffer, I highly recommend picking one up. 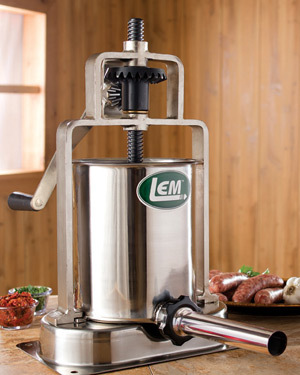 LEM Sausage Stuffer. Sorry, I didn’t get any pictures grinding or stuffing the sausage, but I’ve covered that before. 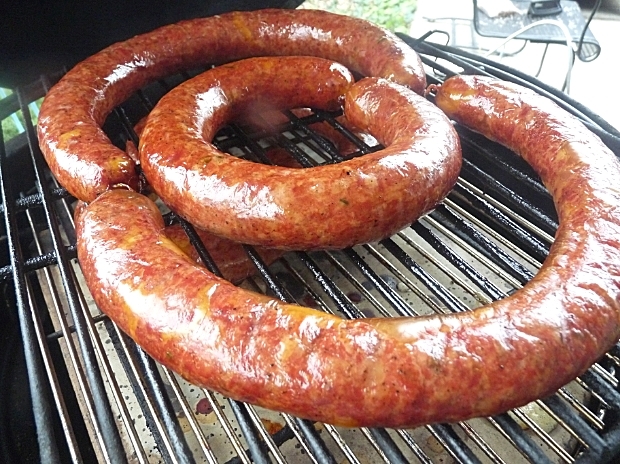 After the last batch of sausage, Mrs. G informed me that she wanted to try a jalapeno cheese sausage. 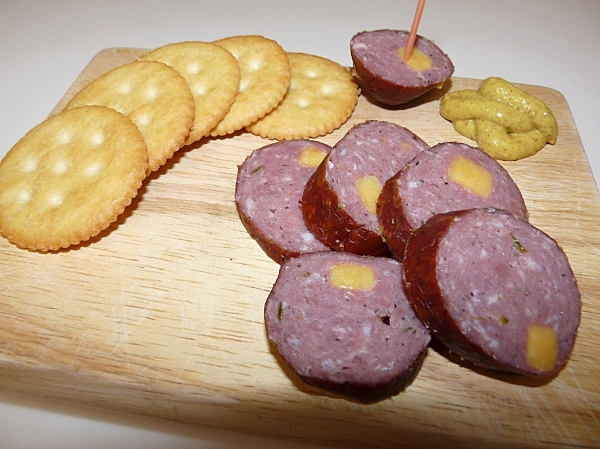 I like jalapeno cheese sausage, so I was not opposed. Friday, I was in need of some sausage casings and some pork shoulder. I’ve been wanting to try out Hirsch’s Meat Market in Plano for a while, so I gave them a call and they had everything I needed. If you are looking for a good butcher in Plano, I highly recommend them. Not only do they carry all kinds of meat, the carry a wide variety of wood from the basic mesquite and hickory, to pecan, peach, plum, citrus and grape, just to name a few. Super friendly staff and very helpful. 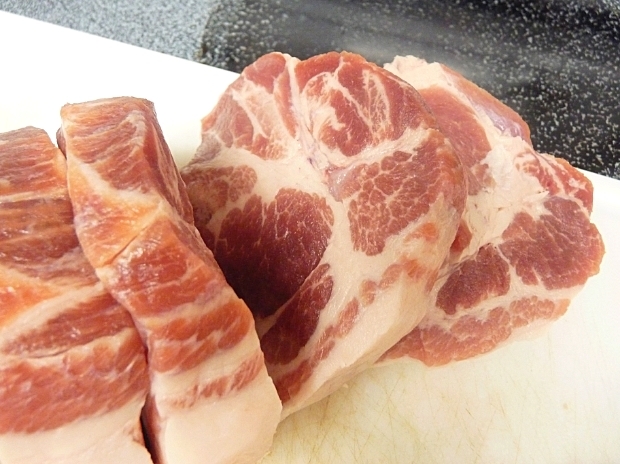 Look at the marbling in that pork shoulder! They set me up with 2.5 lbs of pork shoulder (that had a ton of marbling) and .62lbs of pork back fat to make up for the lack of fat in my venison (in sausage, fat is your friend). 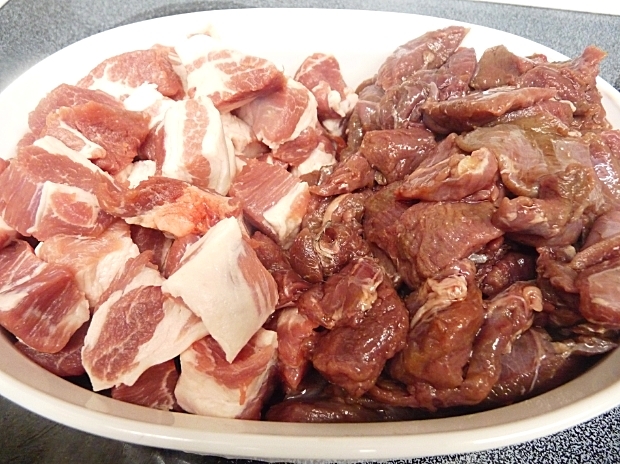 Can you tell which side is the pork and which side is the venison? I figured you could. Very important to test fry a patty before stuffing. You know…quality assurance? Gives you a chance to adjust your seasonings. Cube up your pork, venison and back fat into pieces small enough to fit through your grinder. Place meat and all metal parts of your grinder into the freezer for 30 minutes. (Heat is your enemy when making sausage. It causes the fat to melt and smear. You don’t want that). After 30 minutes, assemble grinder and using a medium grind attachment, grind all your meat. Mix up the spices in a small bowl. 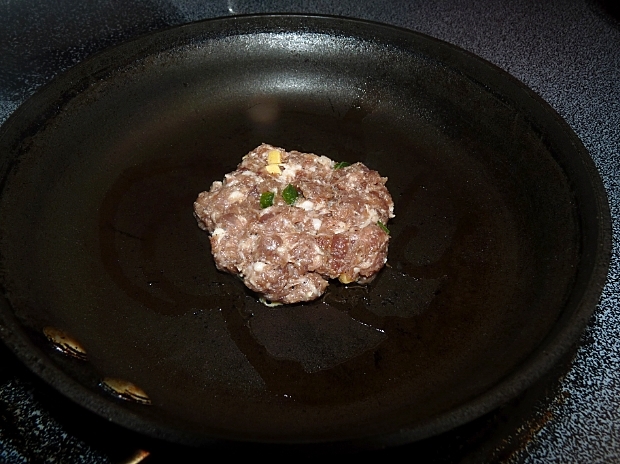 Work the spices, jalapenos and cheese into the meat with your hands, adding the water in small amounts as you go. Take a small portion and test fry a patty. Adjust the seasonings as needed. At this point, the meat can be stuffed into hogs casings. I prefer to let it sit covered overnight in the fridge to allow the flavors to meld and marry and stuffing the next day, however. Stuff the hogs casings with the meat mixture following your stuffer’s instructions. 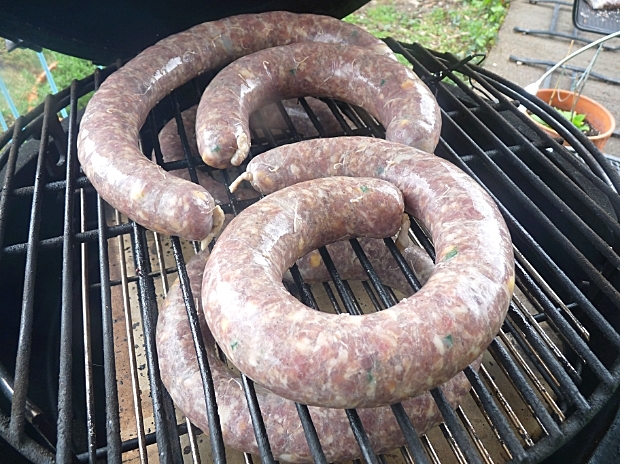 I chose to do my sausage in 1lb links this time (or as close as I could get them, LOL), but you can make them whatever length or size you want. 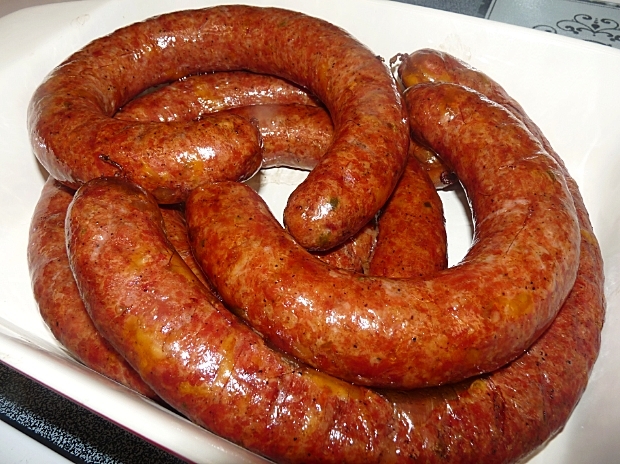 Allow sausage to sit out at room temperature for one hour to allow them to dry out. If you have a small fan, you can use it to blow across them. Meanwhile, set up your smoker as low as you can get it. 100F to 130 F would be ideal. Do NOT add wood for smoke at this point. 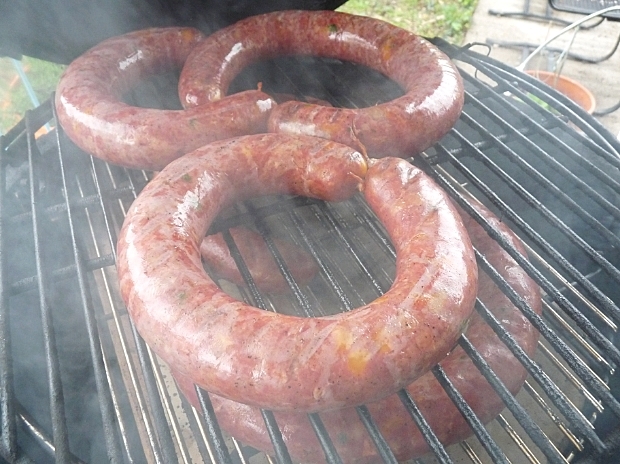 Add your sausages to the smoker and allow to further dry for one hour. After one hour, bump the temperature to 140F and add wood chunks for smoke. We used pecan and some hickory chips. Every hour after, bump the temperature 10 more degrees until your sausage hits 155F. When your sausage hits 155F, remove from smoker and plunge into and ice bath to stop the cooking. Allow to cool. Once cooled, remove from ice bath and let bloom for one hour (Sit out at room temperature either on a drying rack or hanging up). Refrigerate or vacuum seal and freeze for a later date. Onto the Egg at 12:00 pm! I’d like to say that with my Big Green Egg and pit controller, I was able to follow my smoking instructions perfectly. Unfortunately, it was not to be. I was having a problem getting that small of a fire started. It went out once on me while I was trying to get it stable. I ended up putting the sausage on at 145-150F and about 25 minutes later, I had to pull everything out and restart the fire. One hour in (1 o’clock). At one hour in, my fire was now at 170 (way to hot, way to early). I added two pecan chunks and some hickory chips for smoke. I also wiped away any moisture from the outside of the sausage casings and flipped the ones on top with the ones on bottom. Being open for so long allowed the temp to drop. By 1:30pm, the temp was sitting at 150F which was not so bad. At two hours in, my temp was around 165. A little high, but still acceptable. 3 hours in, getting close (3 o’clock). At 3, we were holding steady at 175 but now we were getting short on time. We had people coming over later and I still had to get to the store. So at 3:40, I opened the Egg up a bit to speed things along. By 4:10, we were up to 230F. Once finished, the sausage was pulled and immediately plunged into an ice bath to stop the cooking. 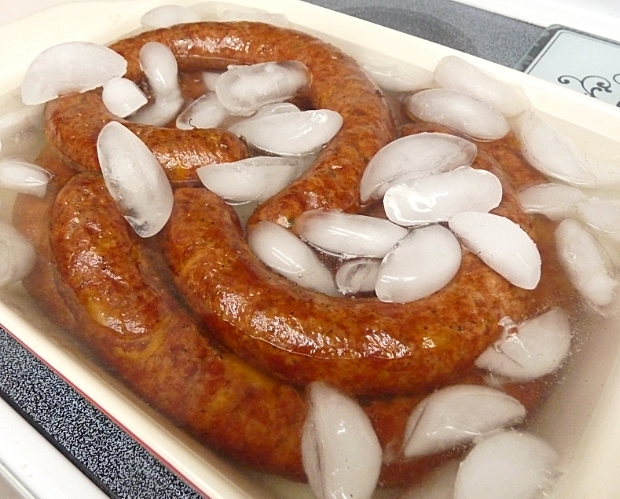 Sausage taking a dip in an Ice bath. 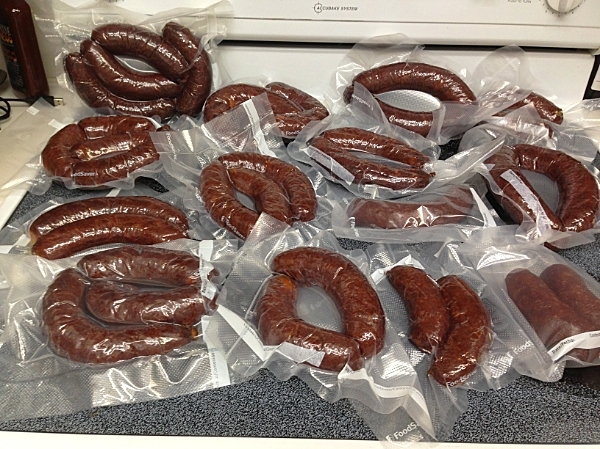 After cooling, the sausage was allowed to dry on some of those cookie cooling racks for an hour before most of it was sealed with a vacuum sealer and frozen for later. One link did go into the fridge to be sampled on Sunday. It was killing me to wait, but I had to get to the store and get some groceries and get cleaned up for company. Sunday rolled around and I lit up the Egg to 400F and grilled up the sausage. Look at how juicy that is!! Mrs. G paid me high compliments on this sausage saying “This is the best sausage you’ve made so far!” and “This reminds me of the sausage my dad used to make when I was kid!” Can’t get better compliments than that, especially considering he used to have a BBQ business and made his own sausage. Me? I enjoyed it, but sometimes I’m my worst critic. It was plenty juicy and had great flavor. Good snap on the casing. But it just wasn’t perfect. For one, there wasn’t enough heat. I’d like to maybe had some cayenne or red pepper flakes or chipotle powder. Not sure, what do you think? I also didn’t really care for the jalapeno, it still had some crunch to it. Maybe sautee it down a bit or use dried jalapenos next time. Next comes the cheese. It didn’t melt away, but it did melt. I’m thinking I’m going to use high temp cheese (cheese specifically made not to melt, often used in sausage). Hirsch’s Meat Market has it, so I do have a local source. The final thing is the texture. I mean it was fine (not a pun, it was really coarse), but I’d like to see what a double grind would do. Once through the medium grind plate, and then a second time through the fine grind plate. But then again, I’m afraid it would end up with the texture of a hot dog, and I really don’t want that. 15 lbs on 3 seperate racks, smoking away. A couple of weeks back, I made another batch of this sausage. 15lbs to be exact. I implemented some of the changes I talked about. First, I took my jalapenos and gave them a quick pulse in the food processor. I then sautéed them up a bit in a skillet so that they would not have that “crunch”. Worked like a charm. I stuck with a mild cheddar cheese, did not go to a high temp cheese. There’s something about high temp cheese. I’m just not a fan of it. 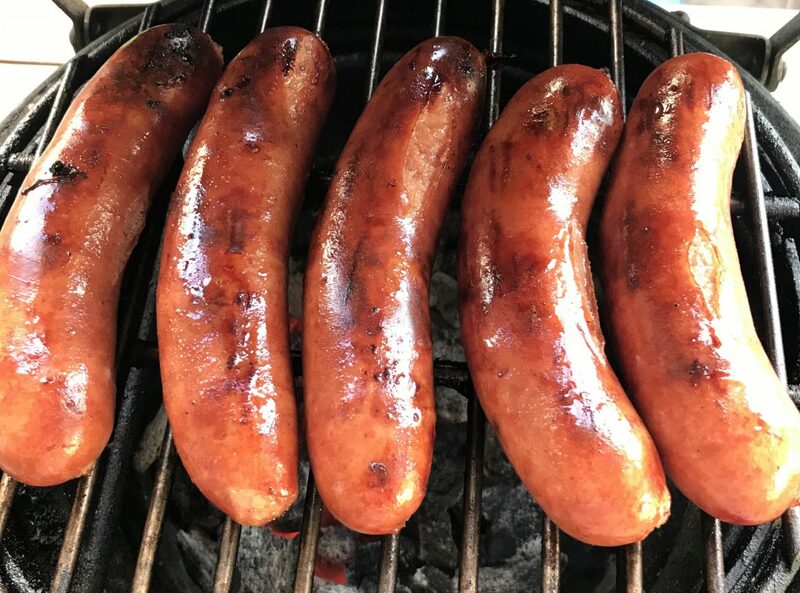 This time when I smoked the sausage, I was able to maintain a temperature under 180F until the very end when I lost patience and jumped it up to 200F. Keeping a low temperature really prevented the cheese from melting in the sausage. I’ll stick with regular cheese. Didn’t do anything about the heat level of the sausage. I really didn’t want this batch to be spicy. The final change was the grind. I did a first grind with a medium plate. Then I mixed in my spices and did another grind with a fine plate. Gave it a different texture for sure. Neither a good thing or a bad thing, just different. 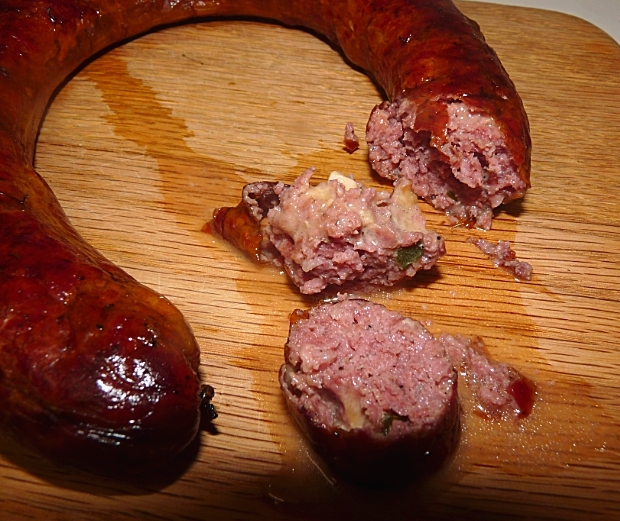 Since it was fully smoked, I ate some cold and it reminded me of a summer sausage, both in taste and texture. Think I’ll continue the double grind. Since we made the sausage, I think we’ve eaten 7 links already. We are both happy with it and so have all the other people who have tasted it. Awesome, and well done. That’s something I’ve long meant to get into, but just never have got around to it. Looks like you had allot of fun. I might have to ask for the sausage stuffer for Christmas, and go from there. You do good work Griff! Although it takes a lot of time, making sausage sure is fun and rewarding. Whatever you do, don’t get the Kitchen Aid grinder and stuffer attachment. I’ve heard nothing but bad things. I’m currently using a Kitchener #12 from Northern Tools (about $100) and an LEM 5lb stuffer ($150). You can do it with just the grinder, but a dedicated stuffers is well worth the money. Im glad to hear you like the stuffer. Going to be buying one in the next couple of month. Made 15 lbs of Brats this week. Its just to much work stuffing with the grinder. Your receipe sounds great I will have to give it a try. I like it hot, my cajun blood, so will probably add some red pepper flakes. Cant wait. Did you ever get the stuffer? How did it work out for you? Did you like the sausage? super post, try running twice through the grinder with the medium grind. I have found that it makes a really great texture. Might be what you are looking for. That is too funny. What a great Apple Fool’s Day prank that would be. This looks amazing. I would love the spreadsheet to calculate the sausage ingredients. I saw your post about breakfast sausages and can’t wait to try that too. 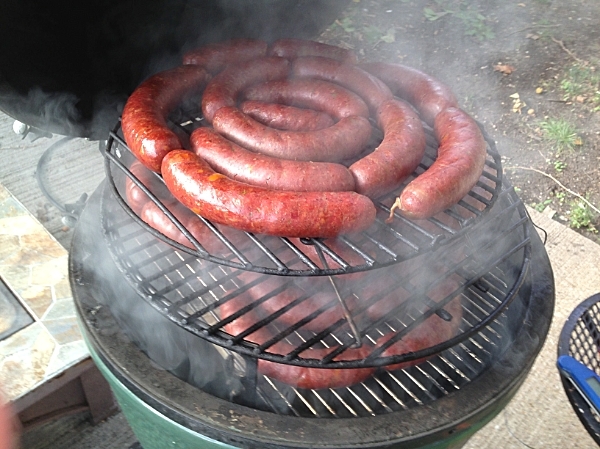 Do you smoke your sausages on the BGE? I have an adjustable rig from Tom, but not a controller. Looking into them though. Thanks Griffin! Spreadsheet downloaded just fine. Haven’t worked with it yet. Just learning the “ways” of sausage making. I really appreciate it. Next I need to decide on a controller. Cool. Can’t wait to see what you come up with. As for the controller, you can spend anyhere from $99 to more than I’d feel comfortbale spending just depending on what bells and whistles you want. If you haven’t looked already, check out the Naked Whiz’s website. he’s got review on just about everything out there. Thanks, I have been to the Naked Whiz’s site and looked over some of his reviews. Naturally, I want the DigiQ or the CyberQ WiFi. Tom also recommended him. I have a grinder attachment for my Wolfgang Puck stand mixer on it’s way and an attachment from LEM for a sausage stuffer shipped today. I have the Jerky Cannon already (great stuff), so I will see how well we “take” to making sausages, then we’ll go to the LEM 5 # vertical stuffer with metal gears. It’s just hubby and I, so a 5 #er ought to be just right for us. Best of luck. Make sure to soak your casings and take your time. It’s when you rush that you end up getting “blow outs”. If you need any advice, let me know. If you get into sausage making, I highly suggest a vertical stuffer. Makes is so much easier. We have the 5# and its just the wifey and I and it works great. Thanks Griffin! Will do. I think we’ll enjoy sausage making. It just makes sense to not buy commercially made sausage due to the fat content. Looking forward to it. This Sausage recipe turned out great! I would love to get the spreadsheets to calculate sausage recipes. Great Site, Great Food, Great Job! Thank you so much for the feedback. Check your e-mail, the spreadsheet should be on its way. I would like the spreadsheet as well. And would you change anything as far as time and temperature if using an electric smoker? Thanks! Could I please recieve a copy of your sausage spreadsheet that helps calculate everything. Send me an e-mail to jgriffin495@gmail.com and I’ll get it to you. could you send me a spread sheet as well, oh and what did you use as Cure? Sent a reply to you this morning. I used DQ Curing Salt which can be used interchangeable with Cure #1, Prague Powder # 1, Insta-Cure, Modern Cure. Any Curing salt that contains 6.25% sodium nitrite. I grow my own Jalapenos and store some in the freezer each year. They aren’t as crunchy as fresh when they are thawed out. Just an idea instead of cooking them. Can I please get a copy of the spreadsheet also? I would love a copy the spead sheet you have if you wouldn’t mind sending. Thanks! Looks and sounds perfect! Sent. Sorry for the delay. Was out of town for the holidays. Hope it helps you out. Let me know what you think. Sent. Sorry for the delay. Holidays kept me busy. My buddy us a big hunter and we are always looking for great new recipes for the meat. This one is perfect. I would love the sausage spreadsheet to try some new recipes. AWSOME post bro, looking forward to trying this. Would you please send a copy of that spread sheet, I’m looking for other sausage recipes. E-mail is on its way, Varnes. Thanks for checking out our site. Hope you try some of our other recipes and let us know what you think. I would love to try out this recipe. Any way i can get a copy of that spreadsheet?? Thanks. Sent. Check you e-mail. Glad your first batch was such a huge success. We loved the Venison recipe. I was hoping to get a copy of the spreadsheet. I tried this jalapeno cheddar recipe this past weekend and it was AWESOME! Thanks for sharing. Would love to get a copy of the spreadsheet. going to try this recipe this year, can I get a copy of the spread sheet please? The spreadsheet no longer exists. It died along with the computer it was stored on. Sorry. I have not Jim and I’m not sure how it would effect it. Sorry, I really wish I could help you out there. 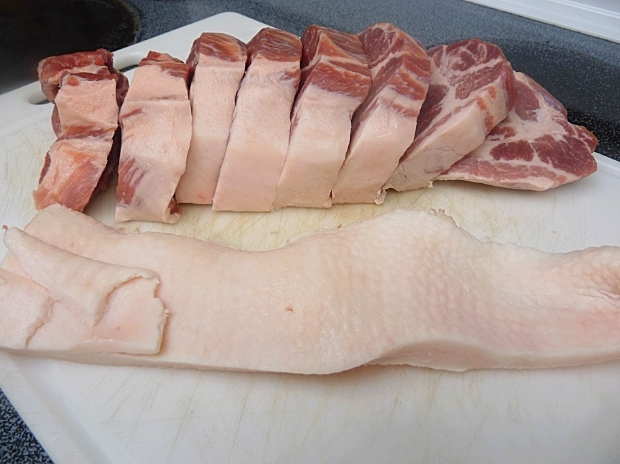 You might try doing a search on google about pork fat versus beef fat in sausage and see if it comes up with anything. thanks!!! Also wondering why the venison/jalapeño sausage is cooked before freezing. Can it be frozen before cooking/smoking? I guess you could freeze it before cooking it, we just wanted to consume some right away and save the rest for later. Easier to just smoke it all in one go, than to pull some out when you wanted it, slow smoke it all day and then eat it. Jim I have used beef fat before in place of pork fat. I usually trim down my brisket and keep the fat. The main thing is freeze it and grind at lowers setting. I like it to come out like powder. Gives a amazing flavor to beer brats. Recipe looks great, this is my favorite type of sausage. The last weekend of our deer season is coming up and if I’m lucky I will get the venison required for a batch of this. Your spreadsheet sounds very handy, a copy would be appreciated. I wish I could give you a copy of the spreadsheet, but it died when my computer crapped out and I have no back up of it. Sorry. How did your last weekend of deer season go? No problem I’ll get by. The last weekend was great, the quest for bucks was over and meat was on our agenda. We got 5 does between 4 people. I have two hind quarters boned out in the freezer along with a couple of butts that I got on sale. As soon as I get the time I’ll break them out and try your recipe. Very nice. I wasn’t able to get out hunting this year. Missed Thanksgiving and with a newborn baby, even though we went to the ranch for Christmas, I never went out hunting. Just relaxed with family and enjoyed the new one. Hi – I would love a copy of the spreadsheet if you don’t mind! 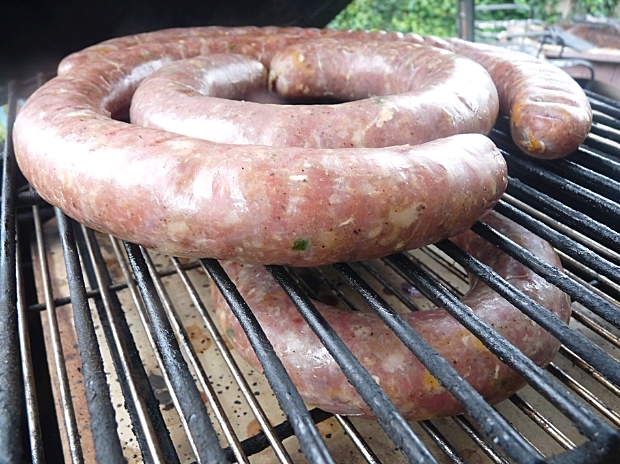 I love making my own sausage, but I agree in that its very time consuming. I’ve needed a stuffer for some time and just haven’t been able to get up the gumption to spend that much on one. I just saw this and my family loves deer dogs made with jalapeño and cheese. Going to try this as well. Would love to get your spread sheet for help! Either way thank you and look forward to reading more. Can you please send me the spreadsheet!! Thank You !! Could I please get a copy of your spreadsheet too? Sorry it has taken so long to get back to you as I hardly ever monitor this blog anymore. Unfortunately, the computer that had that spreadsheet crashed and I was unable to recover it. Sorry, I no longer have a copy of the spreadsheet. I lost it when I had a computer crash on me and I couldn’t recover it. I have included my email address here in my post so anyone with the spread sheet is welcome to send a copy to me. Please and Thank You.